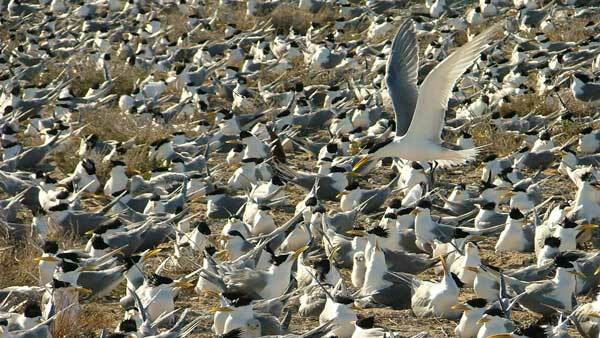 What are the benefits of joining the Seabird Group? Members receive, and are encouraged to contribute to, regular newsletters each year, each full of news and reports on seabird conservation issues and research projects. Members also receive an annual, colour journal Seabird, containing papers and short communications on current research on seabirds of the Atlantic and neighbouring seas. The Group organises regular international conferences, attended by seabird workers and enthusiasts from Europe and the rest of the world. Members have the opportunity to participate in national surveys and monitoring programmes. The Seabird Group initiated the two censuses of breeding seabirds in Britain & Ireland in 1969-70 and 1985-87. The results of these surveys were published in two books: The Seabirds of Britain and Ireland (1974) and The Status of Seabirds in Britain and Ireland (1991). We also helped establish the Seabird Colony Register, begun in 1985, which collates all information on the numbers of seabirds breeding in Britain and Ireland. The Group was part of the SEABIRD 2000 partnership, formed with the objective of updating the Seabird Colony Register by 2002. This was a major project requiring enormous volunteer effort and offered outstanding opportunities to census seabirds along some of Britain's most spectacular coastlines. Members can apply for small grants towards the cost of research or survey projects. In recent years the group has grant aided projects which have included the investigation of: Razorbill demography in northeast Canada; juvenile movements and foraging behaviour in shags on the Isle of May; and productivity and density effects in Skuas on Handa. Gift Aid means the Seabird Group could claim an extra 25% of the value of your membership fees back from HM Revenue and Customs? A high proportion of gifts we receive are made online. If you can put the same email address in this form as you used when making a donation via your PayPal account it makes it much easier for us to match declarations to gifts. We will also use your email address to send you our three annual newsletters. Don’t forget that if you pay Income Tax at the higher rate you are likely to be able to claim further tax relief on your donations, via your tax return. If you’re in any doubt please speak to your tax advisor. Payments made by an individual for somebody else’s membership is not a gift to your charity and will therefore not qualify for Gift Aid. For example, if your paying for the membership of your partner or spouse. The payment will qualify if it is made by a parent or legal guardian on behalf of a child under the age of 18. The Seabird Group is a registered charity with the Charity Commission: 260907. Our registered office is 16 Birch Park, Bangor, County Down, BT19 1RZ.